The 12th annual Easter Cantata, “Hallelujah, Praise The Lamb,” will be held during Palm Sunday weekend, April 13-14, 7 p.m. at Main Street Baptist Church. 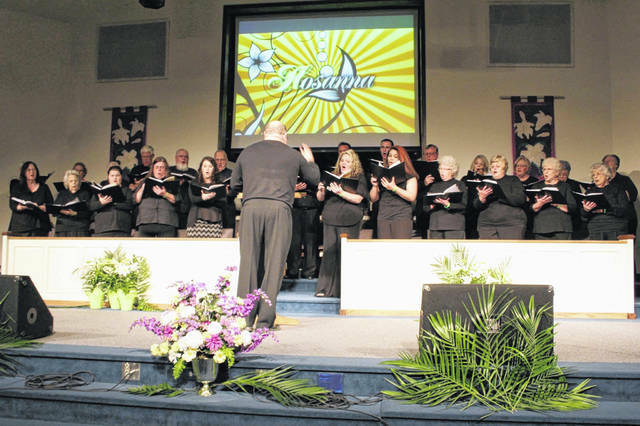 POINT PLEASANT — The 12th annual Easter Cantata returns this year during Palm Sunday weekend. The Mason County Community Cantata (MCCC) will be telling the story of salvation through various vocal performances and narration on Saturday, April 13 and Sunday, April 14. The program will take place at Main Street Baptist Church and will begin at 7 p.m. with the doors opening at 6 p.m. MCCC Director Larry Jones advises guests to arrive early for optimal seating. A nursery will also be available. The program is free of charge, but an offering box will be available for guests at the entrance where the ushers stand. The proceeds of the program will be going to the Mason County Homeless Shelter. Jones explained the staff at the homeless shelter are near their goal amount of funding to purchase land for a new facility. This will be the third time the proceeds from a cantata will be going towards the same charity. Though this is a rare case, Jones commented the community is in great need of this new homeless shelter. The cantata is comprised of approximately 30 voices with over a dozen churches represented among these individuals. The program for this year is titled “Hallelujah, Praise The Lamb.” Jones commented this is one of the best received pieces the cantata has performed and is one of three pieces the cantata has performed twice. The piece is composed by Bill and Gloria Gaither and has group and solo performances along with narration. A few selections of the piece include “We Remember,” “Power of the Cross,” and the title song “Hallelujah, Praise The Lamb.” The program will tell the story of Easter — the death, burial, and resurrection of Jesus Christ all while capturing the hope individuals have in him. The narrator will be Ed Cromley and John Machir will be the accompanying program pianist. Soloists who will be featured include Brandon Sweeney, Anna Maria Butler, Lisa Searls, Randy Parsons, Randy Searls, Kendra Williams, and Mark Kincaid.